While I have a second home in Buenos Aires, my “mobile base” while updating my Moon Handbooks is Chile. That’s partly because the capital city of Santiago is more logistically convenient to my California home, but mostly because I own a car here. 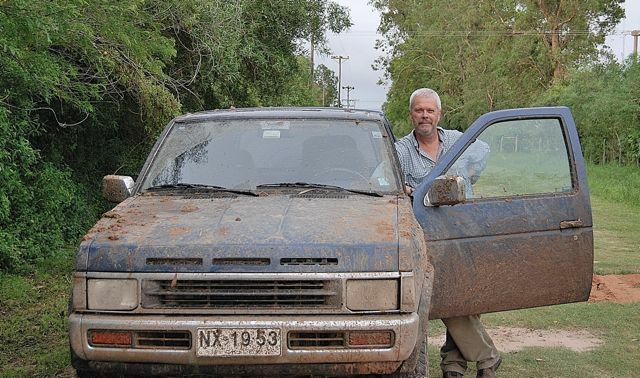 From Santiago, I use my aging but reliable 1996 Nissan Terrano (equivalent to a Pathfinder elsewhere) for overland research on Chile, Argentina and Patagonia (only once have I taken it to Buenos Aires, where I don’t need a car, and I’d prefer not to repeat the experience). On occasion, readers ask me about shipping a car to South America and my reply is that, for a period of four months or longer, it can make more sense to buy a vehicle in Chile. That’s partly because there’s a good fleet of used cars here and the process is relatively simple but, no less importantly, Chile places no obstacles on non-resident foreigners leaving the country with a Chilean vehicle. That’s in stark contrast with Argentina, which considers every car a so-called vehículo nacional, though it’s private property. A non-resident foreigner can purchase a car there, but will encounter problems trying take it out of the country. Rental cars, of course, are an exception. One of my favorite anecdotes in this regard is that of a Swiss family I met in Puerto Octay, Chile, who had purchased a 4WD vehicle in Bariloche. When they first tried to cross the border in hope of driving Chile’s Carretera Austral, Argentine customs officials refused them passage because, they insisted, it was a vehículo nacional that no non-resident could take out of the country. Was their trip over before it started? Returning to Bariloche, they contacted the vehicle’s seller and, at his suggestion, they obtained a power of attorney over the vehicle in favor of his brother. The brother then accompanied them to the border, drove it across and, when they reached the city of Osorno, they bought him a bus ticket back to Bariloche. They then proceeded down the Carretera Austral while knowing, however, that they would have to buy the brother another bus ticket to re-enter the vehicle into Argentina. In Chile, fortunately, such evasions are unnecessary. While Chile’s bureaucracy may be more reasonable than Argentina’s, and has the additional virtue of never soliciting bribes, it can occasionally be confusing for those of us who’ve not grown up in it. I found that out this week while renewing the Terrano’s annual permiso de circular (license fee) and attempting to replace its sello verde, the green windshield sticker that designates vehicles with catalytic converters. Older vehicles without this sticker may be grounded one day a week on “spare the air” days in Santiago, which are most common at this time of year. 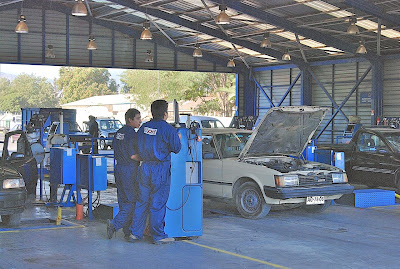 The first step in renewing the permiso de circular is a revisión técnica, an inspection at a privately run but state-licensed test facility (such as the one pictured above). 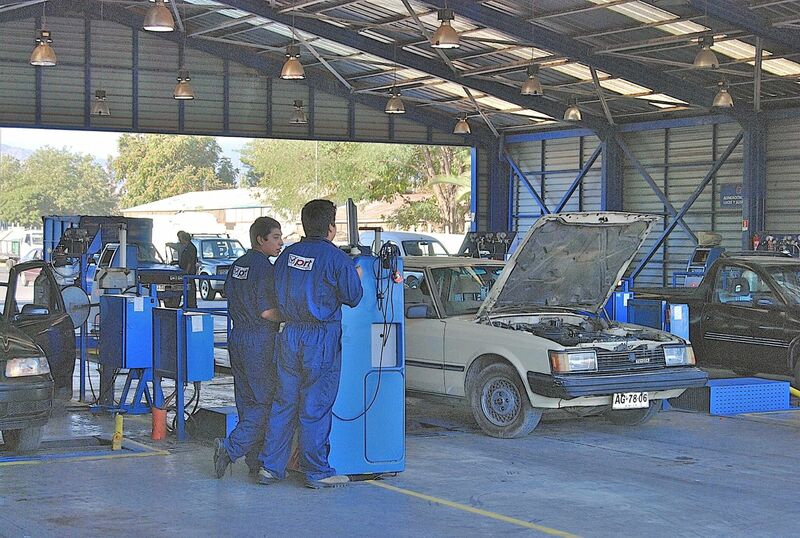 Compared with the biannual smog inspection that we have in California, the Chilean version is far more demanding – not only do the inspectors measure pollutants coming out of the tailpipe, but they also assess the vehicle’s roadworthiness. This means checking the brakes, monitoring the headlights (including their accuracy), taillights and turn signals, and even measuring the tread on the tires – if the tread falls below a certain thickness, the vehicle fails the inspection, and the owner needs to replace the tire(s) before getting the final OK. One advantage of this system is that you can be pretty sure that any vehicle on the street, no matter how cosmetically dilapidated it might look, is indeed roadworthy. The Terrano readily passed the inspection, so it could get a new permiso de circular, but the sello verde was a different matter. Years of exposure to the sun, plus the need to remove it from a cracked windshield and stick it on the replacement, had left it singed black, in tatters and virtually unreadable. Nobody could tell me precisely where or how to replace the sello verde, but my mechanic suggested I go the Registro Civil, the civil registry in downtown Santiago where I had originally transferred the title. An information officer there politely informed me that, unless I was looking to establish residence in the country, perhaps I should ask at the Ministerio de Transporte, the transport ministry a couple blocks away. At the ministry, an equally polite and helpful woman told me I should contact the Dirección de Tránsito in the comuna (borough) of Las Condes, where I got my last permiso. 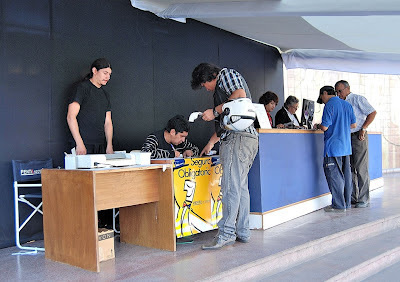 In Chile, individual boroughs issue these permissions and, every March, there’s an intense competition among them to register as many vehicles as possible because that's where they get their tax revenues (pictured above is a typical outdoor registration site, of the sort that's common around town). 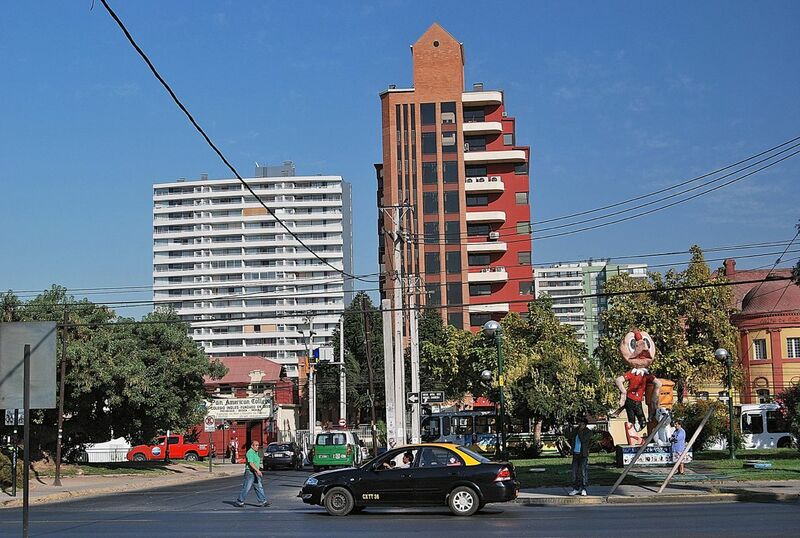 Before heading cross-town to Las Condes, though, I decided to phone to verify the information. In fact, a woman there told me, I had to replace the sello verde where the original permiso de circular was granted and that, according to her, was the easterly borough of La Reina. To be certain, I phoned La Reina’s Dirección de Tránsito and was told that, in fact, the original permiso de circular came from the southerly borough of San Miguel, where I had never been. 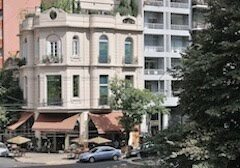 Consequently, I phoned San Miguel’s Dirección de Tránsito where, the woman who answered told me, I should replace the sello verde where I had the last permiso de circular - in Las Condes. I was on a bureaucratic merry-go-round, and "circular" sure seemed to be the appropriate word. How much farther round would I have to go? After explaining this, though, she said that if I were willing to support San Miguel with my tax pesos, she would see to it that I could also replace my sello verde. 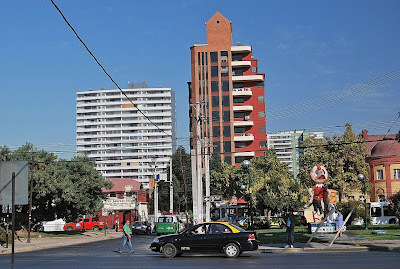 Yesterday morning, after breakfast, I made my way to San Miguel – which turned out to be a pleasant middle-class borough studded with new high-rise apartment buildings (pictured above) – and arranged everything with minimal delay. I’m nearly ready to hit the road.